A way to understand the Baptism in the Holy Spirit is to realize it is a natural result of friendship with the Holy Spirit. It is common to speak of a "personal relationship with Jesus," but did you know you can also have a personal relationship with the Holy Spirit? 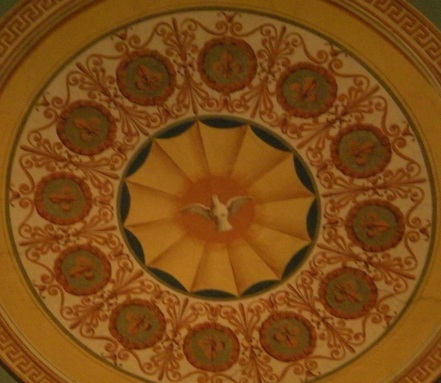 The Holy Spirit is also a Person, a member of the Trinity. The Holy Spirit is real, loves, and guides us. Christians receive the Holy Spirit during Baptism. The Holy Spirit is gentle and respectful and will wait for us to ask Him to fill every area of our lives. The Holy Spirit is like a gift that you receive, but you have to open the gift in order to fully experience it. "My dear young friends, the Holy Spirit continues today to act with power in the Church, and the fruits of the Spirit are abundant in the measure in which we are ready to open up to this power that makes all things new. For this reason it is important that each one of us know the Spirit, establish a relationship with Him and allow ourselves to be guided by Him. However, at this point a question naturally arises: who is the Holy Spirit for me? It is a fact that for many Christians He is still the “great unknown”. This is why, as we prepare for the next World Youth Day, I wanted to invite you to come to know the Holy Spirit more deeply at a personal level. In our profession of faith we proclaim: “I believe in the Holy Spirit, the Lord and giver of life, who proceeds from the Father and the Son” (Nicene-Constantinopolitan Creed). Yes, the Holy Spirit, the Spirit of the love of the Father and of the Son, is the Source of life that makes us holy, “because God's love has been poured into our hearts through the Holy Spirit which has been given to us” (Romans 5:5). Nevertheless, it is not enough to know the Spirit; we must welcome Him as the guide of our souls, as the “Teacher of the interior life” who introduces us to the Mystery of the Trinity, because He alone can open us up to faith and allow us to live it each day to the full. The Spirit impels us forward towards others, enkindles in us the fire of love, makes us missionaries of God’s charity. To develop a relationship with someone, such as a friend, neighbor, or family member, it is important to get to know them by spending time together and communicating. The same is true of a relationship with the Holy Spirit. To get to know the Holy Spirit, start by spending time in prayer. A great way to start is to turn your heart towards God in the morning and say, "Good morning, Holy Spirit." During the day remind yourself that the Holy Spirit is with you, speak to Him as you would with a close friend, ask for help with difficulties, and thank the Holy Spirit for His presence and love. By getting to know the Holy Spirit, He will help you also to get to know God the Father and Jesus. The Father, Son, and Holy Spirit are one God, but three Persons who invite you to share in their life and love. Love would not be satisfied if it were not given and received, and thus God exists as the Trinity. The members of the Trinity share an eternal existence of love, and you are invited to share in that starting here on earth by living in friendship with God.